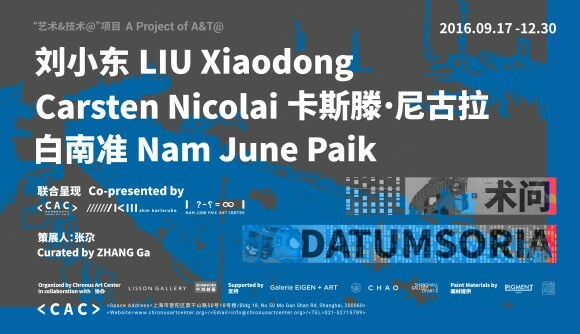 Chronus Art Center is pleased to announce the much-anticipated presentation of Datumsoria: An Exhibition of Liu Xiaodong, Carsten Nicolai, and Nam June Paik. A neologism, Datumsoria conjugates datum and sensoria, denoting a new perceptual space immanent to the information age. In contrast to the topsy-turvy fabrication of a pictorial sensibility through live-streamed data as evidenced in Weight of Insomnia, Carsten Nicolai’s installation unitape offers an examination of perception on graphic structures that resemble punch cards of the early computing era. If Liu Xiaodong’s gradual abstraction of live streaming data is the result of the additive entropy of real world uncertainty, Nicolai’s immaculate images and sounds are pure mathematical precision that illuminate an algorithmic sublime. 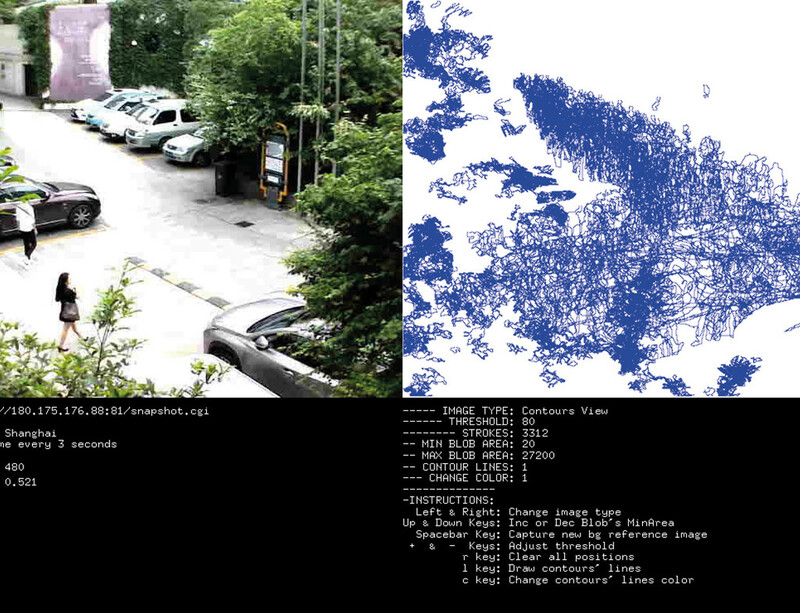 Series of patterns and endless permutations reminiscent of code-scanning reverberate with generative sounds. Here repetition creates difference and difference engenders unison that is charged with psychic force as well as pictorial finesse. The materiality of the generative data is manifested by the very projection medium and heightened in the mirrors flanking the projection screen to both sides, extending the field of imagery in infinite depth and breadth while the sonic cadence echoes reverberatingly to create a totality of sensory immersion. unitape borrows its inspiration from the artist’s involvement with the history of the city of Chemnitz, once one of the most important locations of the German textile industry. Inspired by the invention of the mechanical loom by Joseph-Marie Jacquard (1752–1834) which enabled the swift production of complex patterned fabrics using the principle of automated control by punch cards, Nicolai’s unitape reflects on communication processes in the industrial era while at the same time addressing issues related to the socio-psychological aspects of the interaction between man and machine. As part of the public program associated with the exhibition, MIT professor, art historian Caroline A. Jones will deliver a lecture titled “Energy / Entropy — Art, Autonomy, Information” on Sunday, September 18th. Born 1965 in Karl-Marx-Stadt, Carsten Nicolai is a German artist and musician based in Berlin. He is part of an artist generation who works intensively in the transitional area between music, art and science. In his work he seeks to overcome the separation of the sensory perceptions of man by making scientific phenomena like sound and light frequencies perceivable for both eyes and ears. Influenced by scientific reference systems, Nicolai often engages mathematic patterns such as grids and codes, as well as error, random and self-organizing structures. His installations have a minimalistic aesthetic that by its elegance and consistency is highly intriguing. After his participation in important international exhibitions like Documenta x and the 49th and 50th Venice Biennale, Nicolai’s works were shown worldwide in extensive solo and group exhibitions. His artistic œuvre echoes in his work as a musician. For his musical outputs he uses the pseudonym alva noto. With a strong adherence to reductionism he leads his sound experiments into the field of electronic music creating his own code of signs, acoustics and visual symbols. Together with Olaf Bender and Frank Bretschneider he is co-founder of the label ‘Raster-Noton. Archiv für Ton und Nichtton’. Diverse musical projects include remarkable collaborations with Ryuichi Sakamoto, Ryoji Ikeda (cyclo. ), Blixa Bargeld or Mika Vainio. Nicolai toured extensively as alva noto through Europe, Asia, South America and the US. Among others, he performed at the Solomon R. Guggenheim museum in New York, the San Francisco Museum of Modern Art, Centre Pompidou in Paris and Tate Modern in London. Most recently Nicolai scored the music for Alejandro González Iñárritu’s newest film, ‘The Revenant’ which has been nominated for a Golden Globe, BAFTA, and critics choice award. Courtesy of the artists and Chronus Art Center, for further information please visit www.chronusartcenter.org.